UPDATE: Our Paint Nite at PARENTS' NIGHT OUT was a success! If you missed out this time, make sure to keep up with us for our next event and check out the photos below. Thanks to everyone that came and supported us! October 1, 2016 - Save the date! Being a non-profit comprised of seven moms, we understand how important it is to have time away from the household and the kiddos (as much as we love them)! 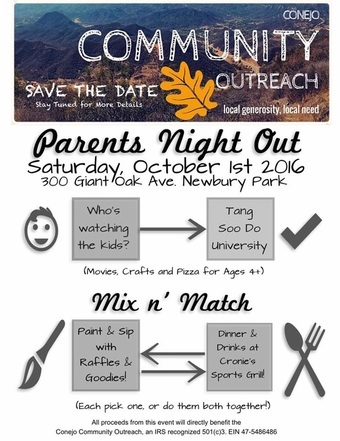 So, we've decided to host a Parents' Night Out Extravaganza! Not only will you get out of the house with options for affordable childcare, we've got lots of fun treats in store. And, even better? 20% of the proceeds from the evening's festivities will be donated directly to CCO, helping us fund our annual Conejo Community Thanksgiving & Community Closet! Here's where it gets good: your options for childcare, dining, and Paint Nite are all in the same complex! We know how important time is, and with everything just a couple steps away from one another, life gets a whole lot easier. Whether you only want to Paint n' Sip, or perhaps grab wings at Cronies before you dive into creating a masterpiece, we have options, and a little something for everyone! PAINT NITE is being hosted at Busy Bees Paper Craft Studio in Newbury Park! We've got your wine covered (2 glasses per person, thanks Sprouts! ), plus a raffle & goody bags are in the making! Please purchase your ticket by September 15th to be eligible for raffle prizes. 20% of proceeds from your purchase at Cronies will be donated to CCO. Cronies Sports Grill has made a name for itself by providing the Ventura County community with a place to celebrate all things sports, while enjoying great food and our famous Smokin’ Cold 20 oz. Schooners. *These prices only eligible with Paint Nite or Cronies purchase. Regular prices for the evening: $30, $20, & $10 respectively.